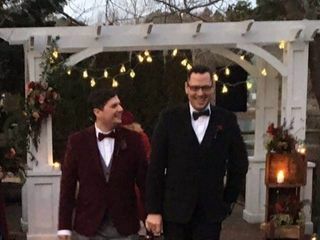 My husband and I got married at The Smithville Inn this past December. We had a great experience during the planning process, and have so many amazing memories from our wedding day, thanks to all that the staff at Smithville did! Kyle was very responsive during the days before the wedding, and he answered every one of our questions in a timely manner. He and Justine made the entire day flow so nicely. They put all of our decorations out exactly the way we were envisioning them. 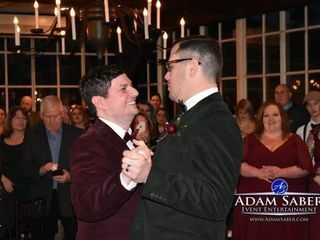 I remember walking into the reception room just before the ceremony was about to start, and tears started to form in my eyes once I saw how the months of planning and visioning my husband and I did truly came to life that day. 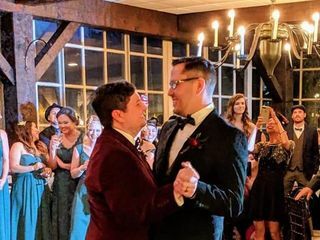 We had the winter wonderland wedding of our dreams, and we are so thankful to everybody at The Smithville Inn for all of their help in making that happen. Bonus points, the food was AMAZING. They give you plenty of options for your guests, and are so accommodating with food restrictions. We actually had a completely vegetarian wedding menu and it was so easy to swap a few things out that we wanted switched. The village and the Inn itself are so incredibly cozy and inviting, which is what my husband and I wanted on our wedding day. We loved how charming and full of history the Inn is. Especially with the Christmas decorations everywhere, the entire atmosphere was so timeless and low-key -- yet romantic and warm. We are so happy that we get to come back to Smithville anytime we want and go back to the absolutely wonderful wedding day we were able to enjoy here. I highly recommend holding your wedding at The Smithville Inn! We got married at the Smithville Inn on 9/7. Our day was absolutely perfect! We had to make the late decision to have the ceremony inside. Although I was naturally a little disappointed, it was still a very pretty space and Kyle made sure we at least had our cocktail hour outside (it was just one passing thunderstorm so cleared up in the middle of our ceremony). Kyle and Justine made everything run so smoothly. I received nothing but compliments from our guests. The food was AMAZING. They even boxed up some of our cocktail hour food in addition to our dinners for us which we enjoyed the next day. I was planning from 3 1/2 hours away. This was never an issue. Justine and Kyle answered my emails within 24 hours, and made sure to have an answer for all of my questions. They allowed me to be a stress free bride on my wedding day and that was the most amazing gift anyone could have given us. All of my dreams came true on 6/16/18 when my husband and I were married at the Smithville Inn. We have been going to the town of Smithville for years, and on the night of our engagement, we didn't even hesitate that our dream wedding would be at The Smithville Inn- with one venue visit, we were booked! They book up early, we booked 18 months in advance and scored the last weekend in June - so do not hesitate and book your spot with them. Kyle and Justine made the entire planning process easy. Every email is answered in a timely manner, no question is too big or too small. They answer everything,and fast! You are in the BEST hands with Kyle and Justine. Every appointment at the venue was quick and painless, you can tell they work as a well-oiled machine. With all of the weddings they do, they treat you like you are the only wedding that matters when you are with them! Our wedding weekend, both Kyle and Justine were cool, calm and collected. Every detail I thought about meticulously for months came to life with their creativity. I never felt so calm leaving all of my wedding decor in their hands the morning of my wedding. It was an absolute dream walking into the venue and seeing everything come to life! Justine even took cocktail hour decor and took it upon herself to reuse all of it and decorate a hutch in the reception area! I love that they reused everything; even our welcome sign from the ceremony ended up being reused! I LOVE that they did that. They even caught some minor errors I made and asked me about them the morning of, and I never ever would have caught them (the menu I printed was in the wrong order so they wanted to verify the order I wanted the food to come out in). My family cannot stop raving about the venue, the service, and the food. If we could do it all over, we would choose the smithville over and over and over again. We are so lucky! We love you guys! 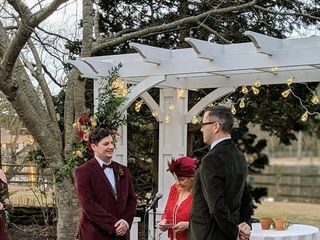 We had our wedding at Smithville in April 2018, and we absolutely loved it. Everything was so easy and great, and we are very happy that we went with Smithville. Kyle and Justine are great and really did a great job executing our wedding. I cannot say enough WONDERFUL things about smithville and their team. Justine and Kyle were phenomenal front start to finish. Prompt, responsive, accommodating. My day ran seemlessly, thanks to them. They are a well oiled machine and made the perfect venue even more magical. I cannot say enough amazing things about Kyle and Justine, and the entire staff at Smithville. From our first meeting with Kyle to the day after when we were collecting the rest of our decor from the venue, we could not be more thrilled to have booked with them. First of all, the venue is lovely. It's exactly what we had in mind for our wedding, with it's rustic features and the historic charm of the surrounding village. Our guests were blown away by how gorgeous everything was. The best part for me was working with Kyle and Justine. Literally every single email that I sent to them was titled "one more thing..." and they never once made me feel like I was second to any other event (even though I know they had several other events/weddings going on during my planning). They responded almost immediately, never made me wait on them, and always had an answer for me. Not only that, they had great suggestions for me and let me change my mind a thousand times (which I'm learning is a characteristic of a lot of brides). Our families and friends were blown away by the service at Smithville. The entire staff if warm and friendly and attentive. I cannot speak highly enough or recommend this place more for any and every event. I was married in November at the Smithville Inn and couldn’t be happier with our entire wedding process and day! When it came to choosing a venue, I knew I couldn’t envision myself in your typical “ballroom” setting. I wanted something rustic, without being a barn, something romantic, without being gaudy, and something simple, without being boring. My fiancée and I looked at only one venue (The Smithville Inn) and knew it was the place for us. It was unique and beautiful. We met with Kyle (who even came in early, just to accommodate our schedule!). He answered all of our questions and made the decision to book the venue an easy one! Along the way, Kyle and Justine were available to answer any questions, offer advice, and make us feel comfortable and confident that our wedding day would be everything we dreamed of. The day of our wedding went off without a hitch. We can honestly say that we have zero complaints! Everything was exactly as we had asked for/envisioned. Our wedding guests all commented on how it was one of the best weddings they had ever been to. We didn’t have to worry about a thing, thanks to Kyle, Justine, and their team’s professionalism, positive attitude, and go with the flow personalities. We can’t thank them enough for all they did! Our wedding day at the Smithville Inn was the greatest day of our lives! The entire staff there is phenomenal! Justine was the most amazing wedding planner. She had everything so under control. We came in the day before to drop off a lot of decor and she set everything up perfectly. We were treated so well every time we went there and especially on our big day. We couldn’t ask for a thing more than what they provided for us. The food was AMAZING! Not your typical wedding food at all. Beautiful outdoor ceremony space and rustic ballroom with wood beams and floor to ceiling windows and great view. A Beautiful and delicious wedding cake from the bakeworks is included also. So much better than your run of the mill golf course/country club wedding. The Smithville Inn has so much history and character. Our wedding party booked rooms around the village so everyone was just a short walk away from eachother. Then we had an after party at Fred and Ethel’s, also just a short walk away so most of us didn’t have to drive. However the Smithville Inn provides free valet parking for wedding guests. From the start of the weekend till the end we had the time of our lives. Thank you Smithville Inn staff and especially Justine! My husband and I were married at the Smithville Inn on June 17, 2017. Kyle & Ashley were amazing wedding planners from start to finish. Both were attentive to make sure the wedding was exactly what my husband and I had envisioned. The ceremony, cocktail hour and grand ballroom were gorgeous. 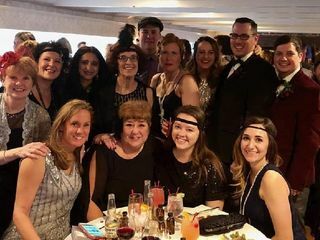 All of the staff and servers catered to us and our guests the entire night and guests are still raving about the food! Smithville Inn has been one of our favorite places to go for lunch/dinner and brunch. I would highly recommend this venue for any special occasion you are having. The planners and staff were highly professional, accommodating, responded back in a timely manner and couldn't be more friendly. Our wedding was hands down the best day of our lives and Smithville Inn played a HUGE part in that. It was not only memorable for us, but for our guests as well. We cannot thank Smithville Inn enough. We love you guys! My husband and I had our wedding at The Smithville Inn on 6/16/17. The staff at The Smithville Inn showed exceptional service to us and our guests!!! The food was fantastic and everything went flawlessly!! The wedding coordinators at the Smithville Inn, Ashely and Kyle, both went above and beyond to make sure our day went perfectly! I would recommend The Smithville Inn to any Bride and Groom. They truly know what they are doing at this venue and will not disappoint. Thank you so much to Ashely, Kyle and the staff at The Smithville Inn for making our wedding day beyond perfect!! It is a day we will never forget! Thank you again!! We truly could not have asked for a better venue for our wedding. The Inn provided a gorgeous back-drop. Every person we met and worked with before and during our wedding was extremely helpful, kind, and accommodating. 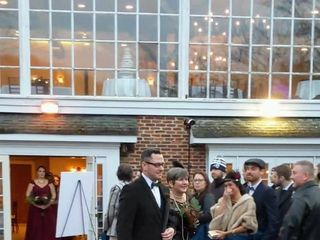 Our family and friends had a wonderful time and couldn't say enough about the venue and the people. I highly recommend the Smithville Inn. Kyle was so on top of emails and requests while being 100% professional! The venue was absolutely beautiful and everything I dreamed of for my boho rustic wedding!!! I wouldn't change a thing, it was the happiest day of our lives!!! Thank you Smithville for bringing my dream wedding to reality! Trust Fran and it all turn out beautiful! Ashely can be counted on and Jeff on the wait staff impressed all my guests. The Smithville Inn went above and beyond expectations in terms of everything, to the good, the beautiful venue with the lake, the location of everything bring right in the village, to the staff working so hard to give us the best day of our lives!!! If you are looking for a one of a kind venue that's gives the most rustic/romantic feel, get married here! The Smithville Inn was the perfect venue for our wedding. Everything was absolutely beautiful and I couldn't be happier! They bent over backwards to get us a vegetarian menu that everyone loves. Ashley Rosenthal was seriously the best when it came to planning our wedding. She legitimately had my back every step of the way. Every question or every little thing I needed she was there to help. The Smithville Inn is absolutely stunning and I am so happy we were able to get married there. Our guests are still raving about how gorgeous everything was! The fact that it's in a historic village just makes it a hundred times more special. I highly recommend getting married here!!! Thank you so much Ashley and the rest of the staff at the Smithville Inn for giving me the wedding of my dreams? 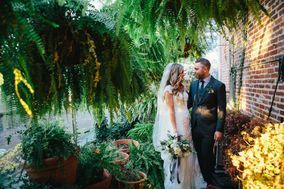 We may be biased but our wedding at the Smithville Inn was Ah-MAZING. From our first meeting with Ashley to the actual day of - it was a fabulous experience. First, Ashley and Kyle were professional, easy to work with, and always got back to me very quickly with answers to my questions (and I had a lot of them). Two days before the wedding, the linens arrived and Ashley realized the napkins did not match the table runners at all. She arraigned for the company to provide a few different options for us to choose from and it worked out perfectly. All of our guests raved about the food - we did a brunch style buffet and it was all so tasty (I wish I could have eaten more). 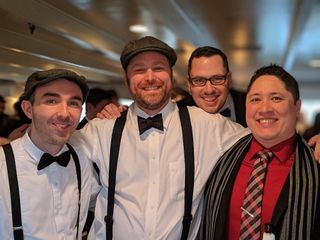 By doing the brunch buffet and open bar with limited choices, we really felt like we got a lot for a small price - great tasting food, delicious drinks, and great service. We didn't feel the need to have a lot of decorations as the venue itself is gorgeous with huge windows that let in the bright sunlight. Our day was perfect and we know that a lot of that was due to the hard work of Ashley, Kyle, and the staff at the Smithville Inn. We couldn't be happier with the way our wedding planning went. The entire staff is truly caring and will go out of their way to make your special day the most memorable. Can't recommend this place strongly enough! Ashley and Kyle were such a pleasure to work with from the beginning.. Kyle even ran back to our hotel room when I forgot the grooms ring in the rush out the door! The venue was gorgeous, the food was delicious, we could not have been happier. When my maid of honor and I dropped off a bunch of totes with decorations and gave an "idea" of the vision I had in my head, I was not expecting it to be all I ever dreamed of and more.. the reception room just exuded classy, romantic and winter without being cliché - honestly it was STUNNING! I've heard nothing but rave reviews from EVERYONE that attended the wedding.. couldn't have asked for a more perfect place to have our perfect day! HIGHLY recommend! !